CES Electrical have recently supplied and installed a large number of mobile generators and cabling for a large marquee event in north Dorset. We are highly experienced when it comes to outdoor events and have the expertise to estimate and supply for even the most elaborate and grandiose occasions such as society weddings and charity functions. This generator installation was for a 21st birthday party with 800 guests. 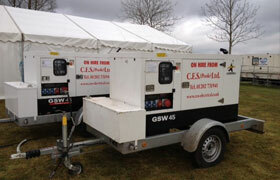 Our generators supplied power for outside catering and refrigeration, lighting and a sound-system for the band! Indeed, wherever possible, we will carry out a site visit in advance to ensure that your event has the necessary power provision for everything that you have planned. “CES are a very professional and helpful company, generators supplied were very quiet which was very important for this event and delivered and installed on time”.